Let us introduce you to some of the many uses of GIS. 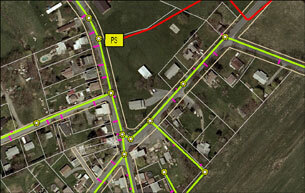 Provide GIS Service at appropriate scale for each client. Provide the most current, accurate, and meaningful data collection and analysis. Maximize cost effectiveness and efficiency. Including mapping and database work, LTL Consultants, Lrd. can provide these services. Plan Archiving - LTL can scan plans to desired formats, create archives, and link images to GIS maps for easy retrieval. Data Collection and Field Work - LTL can conduct water quality sampling, demographic surveying, and GPS data collection to address your planning needs. GIS Purchase Support and Training - LTL can help devise programs, and troubleshooting, of your municipal GIS. Please feel free to contact us with any questions regarding GIS. At your request, a meeting may be scheduled to discuss how we can address your GIS needs.